Workplace violence couldn't happen at your organization ... or could it? Workplace violence can strike anywhere, anytime. It doesn't matter if your company is a small mom-and-pop business or a large corporation. It doesn't matter if you're in Middle America or on the East or West Coast. And it doesn't matter what type of business you work for. In these times of turbulence and unrest, safety and security issues on the home front and in the workplace are more critical than ever before. Terrorist threats, mass corporate layoffs, a depressed economy and political upheaval are all real factors contributing to stress and emotional anguish in the workplace. As people feel pushed to the breaking point, workplace violence becomes more of a reality. Employees need procedures and policies in place to follow in case of emergency, and - just as important - the training and confidence to put those policies into action should the need arise. Your role as a front desk professional requires you to wear a variety of hats during your work day - among them gatekeeper, communications expert, phone whiz, mediator, troubleshooter and secretary. 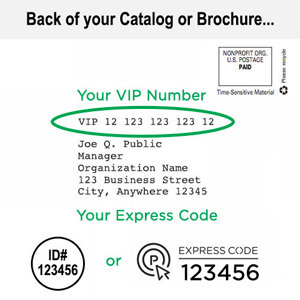 As the first person vendors, visitors and delivery people have contact with, you are the eyes and ears of your organization. It is up to you to spot potential troublemakers, identify red flag behaviors, prevent breaches of security and act with confidence and authority when situations threaten to get out of hand. 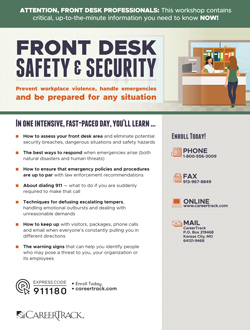 In this powerful, eye-opening workshop, you'll discover a variety of tools, techniques and strategies for securing your front desk area and staying calm and in control when faced with emergency situations. We'll cover preparation and prevention techniques for natural disasters, theft, property damage and other crimes, offer tips for identifying potentially violent or unbalanced individuals, cover building and facility safety measures, and reveal ways to shore up weaknesses in procedures that may leave your organization and employees vulnerable to outside influences. Your role as "gatekeeper": What are your responsibilities regarding safety and security measures? What can you be held accountable for? Telephone skills to help you "listen between the lines"